Venice is a magical city and even more magical in the eyes of children. One of our favorite contributors, Rebecca Winke, takes her 9-year-old and 12-year-old to La Serenissima and reports back with some amazing kid-focused finds. Plus all the details on what to do, where to stay and eat with the family. 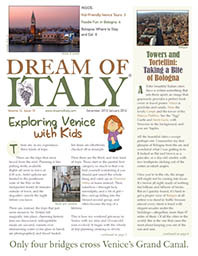 Our expert mom/writer shares specific tips from her family trip to Venice, everything from transportation to souvenirs. Start chatting to a local in a Bologna bar and they’ll soon trot out the great triple cliché: Bologna is La Dotta (the learned), La Rossa (the red’) and La Grassa (the fat). They’ll laughingly plead guilty to all three. Plus all the details on what to do, where to stay and eat in Bologna.